African Masks and Fetishes research papers discuss the history of Native African society and African culture in relation to the art form. One of the earliest forms of art were the works of art made by African cultures. 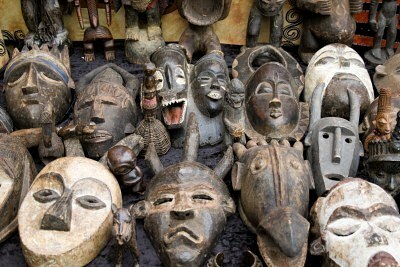 The study of African masks and fetishes reveals that this type of art was rich in the culture and history of Africa. If you need help writing a research paper on African Masks and Fetishes, let Paper Masters custom write your research paper for you. Of particular interest in African history, is the area of religion that encompasses a particular component of worship, the fetish. A fetish by definition is an English word of Portuguese origin that means an object regarded with awe due to its inhabitancy of a spirit or magic. The Portuguese most likely applied this to the African worshiping of certain objects much like the charms and amulets of the Roman Catholic Church where the term ‘feitico’ originated. Once the magic doctor or ‘oganga’, through various ceremonies, according to African belief consecrates an object, a spirit will become localized in the specific object. Anything that can be worn on the person can therefore become a fetish, once it is consecrated. Africans use any small pieces of various items in nature such as seashells, nut shells, stones, and pieces of horn from goats or gazelles. Because these substances contain some degree of a cavity with which the oganga fills with different matter, these types of objects are usually chosen for a fetish. Afro-Creole Culture and Influence Research Papers look at the history of the emancipation of African Americans. Paper Masters writes custom research papers on African Masks and Fetishes and discuss the history of Native African society and African culture in relation to the art form.